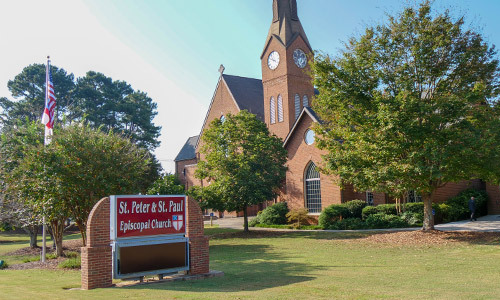 MOPS of The Episcopal Church of Saint Peter and Saint Paul is a gathering of local mothers who support and encourage each other through affirming meetings and fun events. MOPS is short for Mothers of Preschoolers, and we are a place for women with children from birth to pre-kindergarten to find friendship, community, resources and support so they never feel alone. MOPS of St. Peter and St. Paul is organized and run by mothers of preschoolers. We provide Member Care to help meet the physical, emotional, and spiritual needs of our MOPS group. We plan Mission Projects to support the church and various outreach programs throughout the community. We have Programs during select meetings to bring us relevant and interesting topics to help us be better moms, wives and women. We also have Social Events for moms, kids/families and dads as well as Bible studies, Book Clubs, Dining Clubs, Playgroups and much more. MOPS meets at the Church one Monday a month from 9:45am – noon. Childcare will be provided for children who are not in school. For more information on MOPS International, please go to http://www.mops.org. Feel free to email us at MOPSPeterandPaul@gmail.com.